Sunrise’s latest enhancements for Sunrise 365® Retail Replenishment save customers time and provide greater flexibility for replenishment planning. Sunrise Technologies, a Microsoft Gold partner for Dynamics 365 which includes: ERP, CRM, Power BI, and Cloud services, continues to bring its 24 years of retail experience to its latest version of their Sunrise 365® Retail Replenishment solution. The latest update for Sunrise 365® Retail Replenishment provides even greater flexibility for retailers by giving users the ability to configure the daily store/DC replenishment schedules by product. Users will also save time during replenishment configuration with the ability to explode configurations to a specified combination of product and product dimensions, eliminating the need to hand-key data. 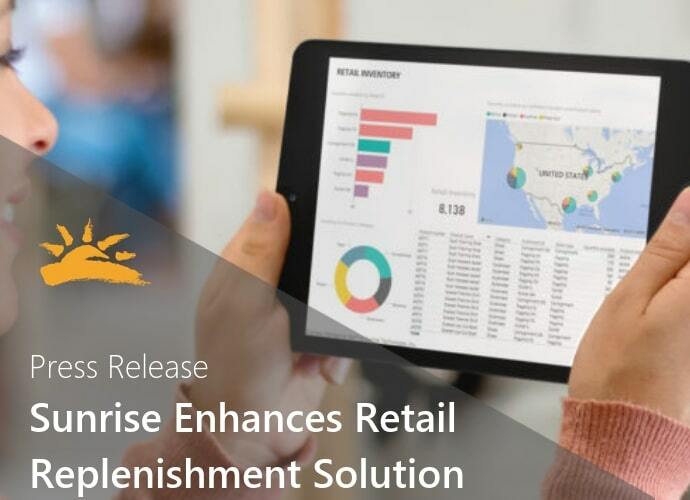 Sunrise’s Retail Replenishment Solution automatically replenishes retail store inventory based on the data within the Dynamics 365 Finance and Operations solution. Microsoft Power BI dashboards embedded throughout the solution provide key insights to users within the interface. Unlike traditional replenishment tools, the embedded nature of the solution dramatically reduces the time it takes to plan and execute retail replenishments. More information can be found on Microsoft AppSource and sunrise.co.